The load cell 355 is often used in multi-cell applications where it can be subjected to side loads, moments and torque if not mounted correctly. These types of forces interfere with the load cells ability to weigh correctly. Using the B&C-355 you can eliminate these types of forces and ensure optimum performance from the 355 load cell. The B&C-355 consists of a ball bearing held between two oversize stainless steel cups. Load is applied to the load cell via the stainless steel cups and the ball bearing. A neoprene sleeve covers the gap between the two cups and prevents moisture and dirt damaging the internal surfaces. The cups are deliberately manufactured with a larger internal diameter than the ball bearing to allow the ball to move and centre. This ensures that the load always comes back to the same point i.e. 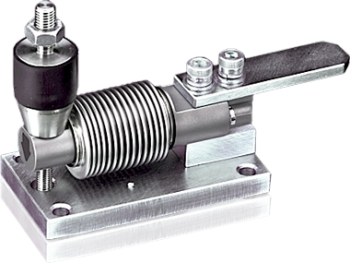 the centre and also does not allow any torque or moments to be transmitted to the load cell. 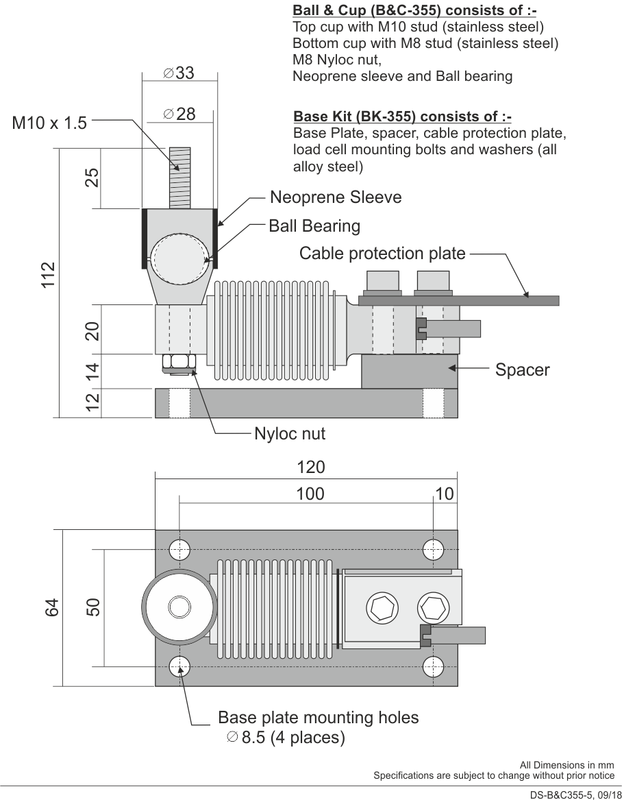 An optional alloy steel base kit (BK-355) is also available to mount the load cell. The base kit consists of a plated alloy steel base plate & spacer, bolts, washers and cable protection plate.